Normally we post up our weekend gig picks on a Wednesday, but got a bit distracted this week. So we’ll keep things short and sweet this week and just pick out one for Saturday and one for Sunday. We promise that next week’s post will be bigger than ever. When the House of Hats started their Harvest Sessions earlier this year, we thought it might have been a little unkind to pull them up on the fact that it wasn’t harvest season. It is now though, and it’s time for this month’s gig, headlined and curated by the band. 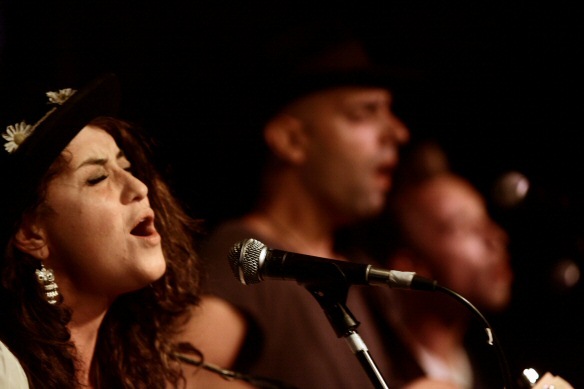 This Saturday they’re joined at The Brunswick by Swell and Woodland Blue. Back in June, The Hundredth Anniversary and Tyrannosaurus Dead appeared on a three-band mini-album called GUTS, alongside London band Gum. 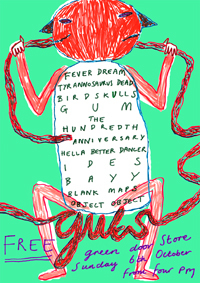 GUTS has now grown into a one day festival at the Green Door Store, featuring all three bands and a fair few others from Brighton and London. There’s full details, including set times, over on the Facebook event page. This entry was posted in Uncategorized and tagged Blog, Brighton, Brunswick, Green Door Store, Guts, Harvest Sessions, House of Hats, Hundredth Anniversary, Music, Swell, Tyrannosaurus Dead, Woodland Blue by brightonmusicblog. Bookmark the permalink.